The pesh kabz probably originated in ancient Persia. The word literally means "fore-grip". 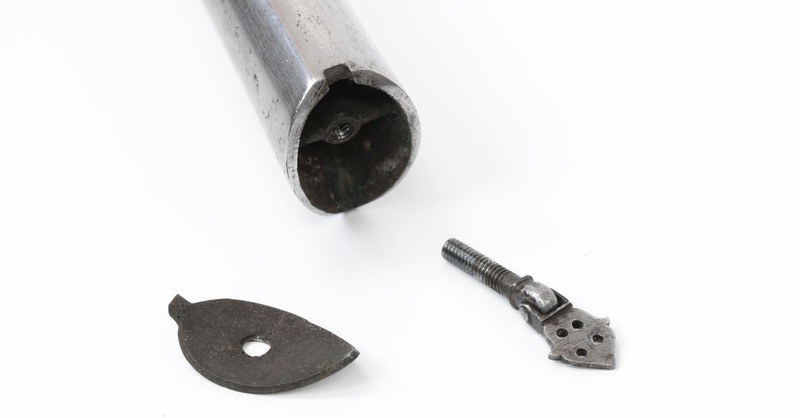 It is characterized by a blade with pronounced T-shaped cross-section for rigidity, and a handle with a hooked end. Most have a double curve to the blade, but some are straight like this example. Originally from Iran, the design became widespread through present-day Pakistan and Afghanistan, into northern India. 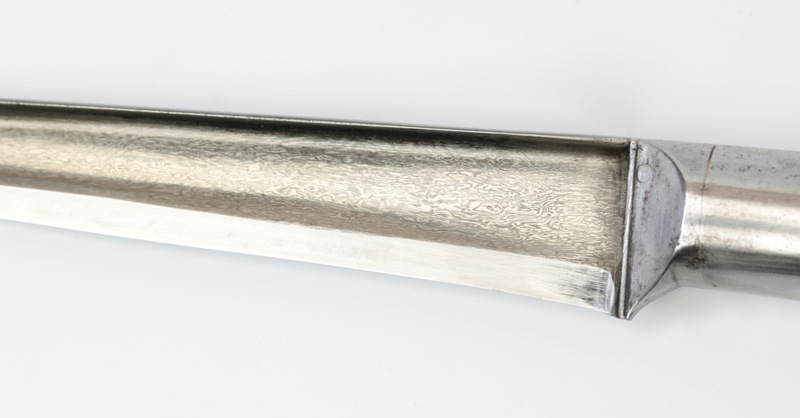 Wootz was a highly prized form of steel for edged weapons, made in a crucible. It developed in south India but soon spread to north India and Persia. Wootz knives and swords were renowned for their hardness and toughness. In order to retain their structure, wootz ingots had to be forged in relatively low temperatures, much lower than normal forging, or the steel would turn into a homogenous mass of high carbon steel. To smiths not familiar with the processes involved, having access to wootz billets was of limited use. Those who were "in the know" carefully guarded the secrets of their trade, and they enjoyed elevated status. Some of the best Indian and Persian wootz smiths ended up working for foreign courts. The art of making wootz was lost in the 19th century and research as to how it was exactly made continues up to this day. Materials:Steel, wootz steel. Scabbard: wood, velvet, silver. I tested the hardness of the blade, which is between 55-60 HRC. 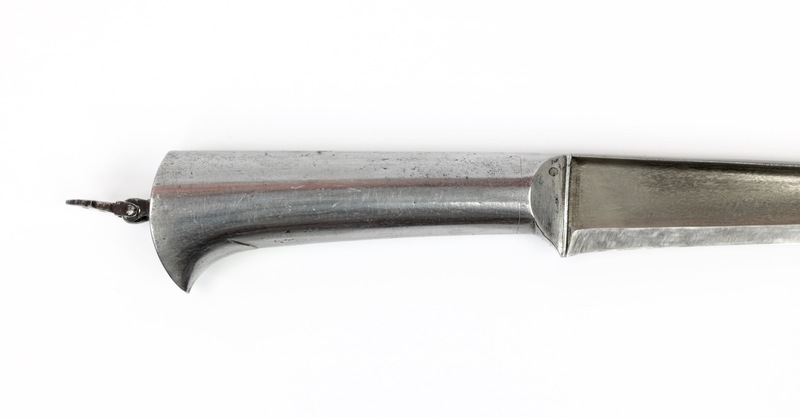 A nice example of a north Indian pesh kabz dagger with all-steel handle. 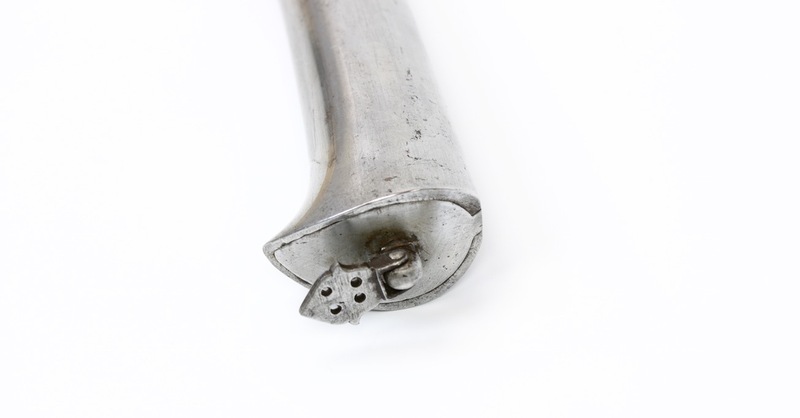 The all-steel construction reminds of many arms that came out of the Bīkaner armory, although this example bears no such markings. The slender blade is made of flawless wootz steel in boldly contrasting shades of silver and dark grew. Blade of very pronounced T-shaped cross-section, narrowing to a very sharp tip. It retains a very keen edge. The handle is well-made and of elegant geometry. 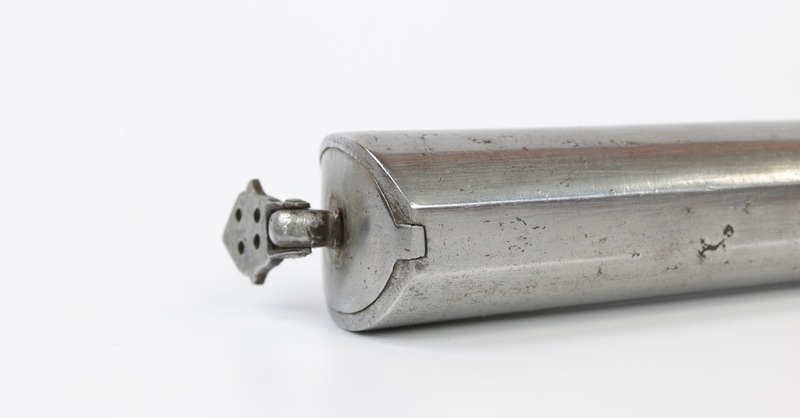 The back of the handle can be opened, revealing a hollow compartment. The scabbard is a recent replacement, though a well-made one at that. Made around a wooden base, it was covered with red velvet. The mouthpiece and endpiece are of silver, finely engraved with floral patterns appropriate for north India at the time. 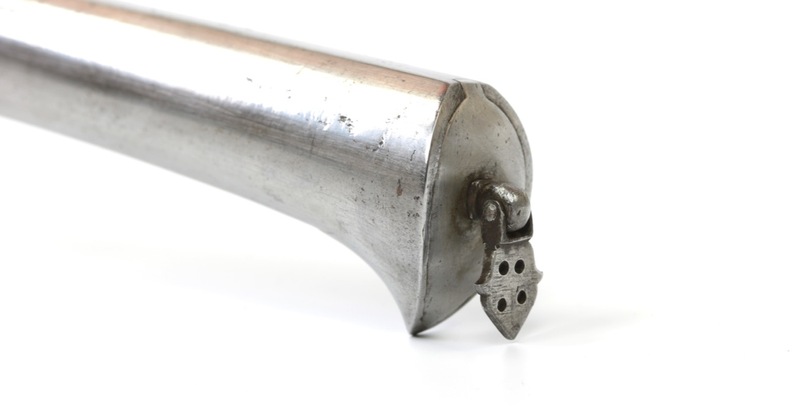 The endpiece has a beautifully sculptured finial with spiraling grooves. The scabbard is a perfect fit to the blade. Overall a nice example of an Indian pesh kabz dagger with fine wootz steel blade.